The Razer BlackWidow Tournament Edition packs many of the high-end keyboard features gamers love, most notably a full mechanical keyboard and support for programmable macro keys, into a smaller, cheaper package. At just over 2 pounds you won’t want to carry this keyboard around with you just for fun, but when you do need to move it the comparatively low weight (along with the detachable USB cord and complimentary storage sleeve) make the process a lot easier. The BlackWidow Tournament Edition, as the name suggests, is ideal for gamers who frequent tournaments or LAN parties and would like a keyboard that’s a little simpler to detach and move around than some of the higher-end gaming keyboards Razer offers. That doesn’t mean that Razer has sacrificed quality for portability, however. The Tournament Edition sports the same Cherry MX Blue mechanical keys as it's older brother, and it feels as sturdy and responsive as any keyboard I’ve used. Razer even finds room for some nice extras, with the function keys acting as convenient multimedia buttons and swapping back out to their standard F1-F12 functionality when needed at the press of a button (specifically F10, which doubles as the “Gaming Mode” switch). The keyboard also has all of the standard anti-ghosting capabilities of other Razer models, so even if you’re mashing ten keys at once you shouldn’t have a problem. While it’s hard to find fault with the keyboard itself, Razer’s Synapse software remains a mixed bag. 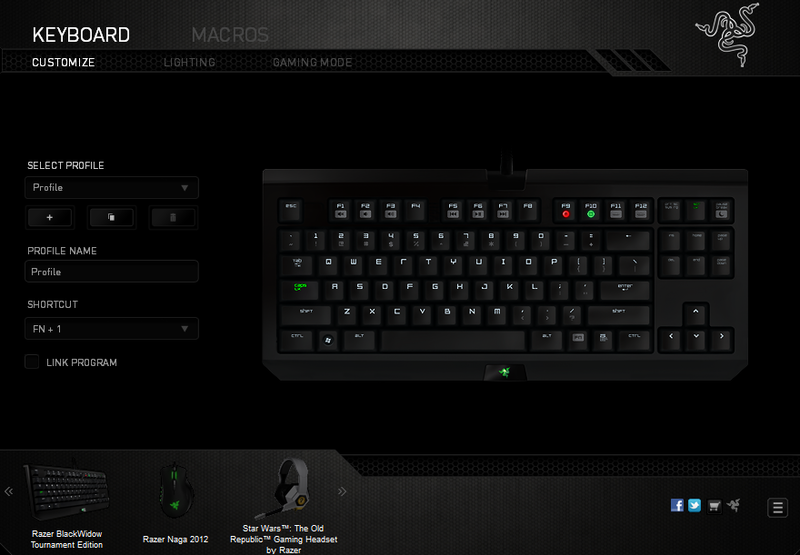 On the one hand, it’s incredibly powerful and allows you to script complex macros to make your gaming easier. It also gives you a great deal of control over how you organize your keybinds and lets you assign macros, alternate keyboard functionality and even settings for your other Razer devices to any key on your keyboard, then store those preferences on remote Razer servers and access them from anywhere by downloading and logging into your (free) Synapse account. 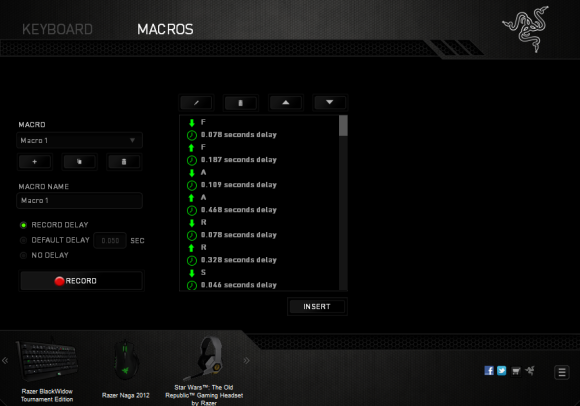 You can use the Razer Synapse application to manage multiple Razer devices and save your settings to the cloud. On the other hand, the latest version (Synapse 2.0) is frustrating both to set up and to use. 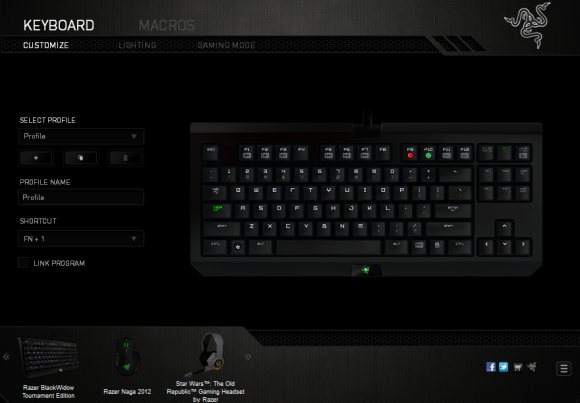 The process of downloading Synapse, tying your peripherals to your Razer account and setting up your preferences is needlessly time-consuming even when you’re familiar with the software; novice users can expect to spend some time learning the precise methods Razer prefers for you to record and bind your macros to your keyboard. Getting the BlackWidow Tournament Edition set up with Synapse and configured the way I liked it took an hour or so. Not terrible in the grand scheme of things, but also not exactly plug-and-play simple. Considering some of the advanced options available in the Synapse 2.0 software, gamers who like to customize and tinker with their hardware settings could spend far longer in the Synapse software. Nothing in the Synapse configuration process is pointless or particularly poorly designed, but if you’re in a rush to get playing (or if you prefer to configure your gaming via the keybinding and macro controls found in your favorite games) it's an extra set of hoops to jump through. All of this effort comes with a big payoff for tournament players, of course: since Razer is saving all of your settings on their server all you have to do to keep your keybindings and macros consistent across any number of computers is download Synapse. For players who tend to do most or all of their gaming in one location, however, the BlackWidow Tournament Edition is a bit more of a mixed bag, losing some features from the beefier Razer BlackWidow 2013 keyboard in exchange for portability. The Tournament Edition also comes with a price tag that’s 20 dollars lower than the larger Blackwidow, however, so its worth asking yourself if you’ll really miss what’s gone. In fact if there’s any problem with the BlackWidow Tournament Edition, it’s with what's been lopped off to make the keyboard more comapct. To make the keyboard cheaper and more portable than its big brother a few things had to be lost, including the numeric keypad and dedicated macro keys. 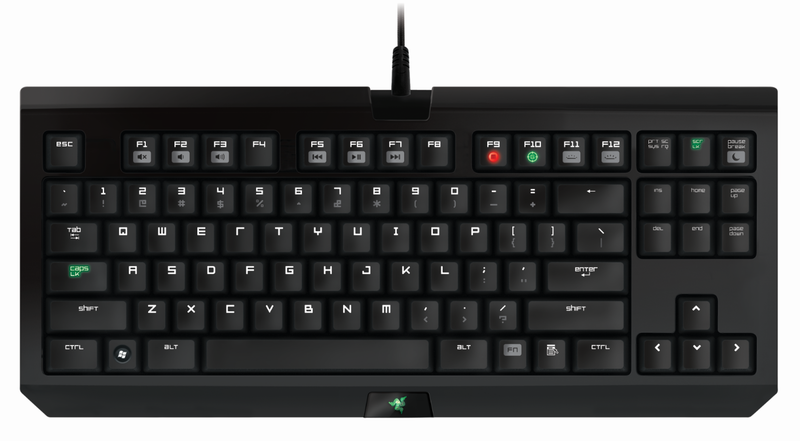 Razer actually touts the lack of these keys as a feature that makes the BlackWidow TE more portable, and they're right; while the smaller keyboard layout isn’t a problem for me, I know several left-handed gamers who use the numpad extensively when gaming. The loss of 5 dedicated macro keys means you'll have to assign your Synapse keyboard macros to regular keyboard keys which might be better left to their regular functionality. This keyboard also lacks the USB port and audio input/output jacks found along the edge of the larger Razer BlackWidow 2013, though tournament players who regularly move their gaming rig probably won't mind the loss since they're constantly plugging, unplugging and organizing cables behind their PC anyway. Overall, the Tournament Edition is a powerful keyboard for gamers that are frequently on the move. It’s cheap, portable, and the compromises it makes for that portability aren’t likely to be deal-breakers for most gamers. Gamers who are just looking for a powerful keyboard to keep in their homes, however, might want to ask themselves if they’d rather shell out the extra twenty bucks for a full-sized gaming keyboard with a few more bells and whistles. A cheap, portable mechanical keyboard with design compromises that aren't likely to be deal-breakers for most gamers. Highly portable due to smaller size and detachable cable. Dedicated gaming key lets you quickly switch keyboard functionality for work and play. Synapse software can be frustrating for novice users.